This small folding knife, which has the signature of the Belarusian designer Dmitry Sinkevich, is the minor brother of the 0454 and 0452CF models, beautiful knives with slender lines, that feature a 10.4 cm long blade and a total length of 23.6 cm. While maintaining in great part the same design, the ZT0450 is a scaled-down version of its predecessors and has considerably smaller dimensions that facilitate it being carried (in Countries where legally permissible) and make it suitable for all occasions. The first model was made with a sober titanium handle, and was followed by an alternative "dark" version - the ZT0450CF – which is the subject of our review. The drop-point blade, 83 mm long and 3.1 mm thick, has the spine lightened by a swedge after which is present a slight jimping. The steel used in this model is the CPM S35VN (60-62 HRC) with matte black DLC treatment. This steel, produced by Crucible's powders technology, offers excellent toughness, abrasion resistance and cutting-edge retention. The opening of the blade, which rotates on ball bearings with KVT technology (Kershaw Velocity Technology), is done via the flipper (also equipped with jimpings to improve the grip). Once the flipper tab is triggered, the blade opens with a surprising fluidity (making it look like an assisted opening knife) and comes to rest on a stop-pin. In this model the pivot is less flashy, and consists of a large Torx T8 screw. The locking system is a frame lock type with a steel insert placed on the flat spring of the frame, which performs both as an interface function with the blade tang and also as a system to prevent the spring extending during the release of the blade. All the mechanical couplings are made to perfection and the open blade is firm and free from play. 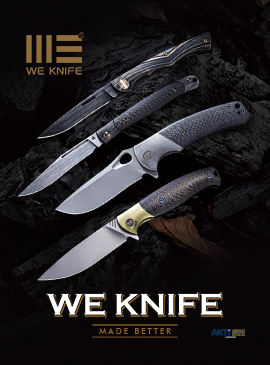 The handle is made of a titanium frame with matte black DLC treatment - reproducing blade coloration - and an elegant and lightweight carbon fiber scale. The 0450CF model is further embellished by two acid-green anodised aluminum tube spacers, which stand out particularly on the black parts. The handle is equipped with a lanyard hole and a pocket clip on which is laser engraved the Company's logo. The pocket clip, with matte black surface finish, is configurable for the ambidestrous carry, but only in tip-up position. Approximately one year after the product is released, the retail price on European market is about €215.00, while on American market is about $180.00. The knife has been tested, as usual, on common materials (such as paper, cardboard, ropes of various types and diameters, car seat belts, etc.) showing an exceptional factory sharpening. The feeling with the tool is absolutely positive and despite, being a small knife, the ergonomics of the handle can be comfortable even for bigger hands. However, given the small size of the handle, it is important to be careful - during opening - not to pressure the flat spring of the locking system since the detent ball placed on the steel insert prevents the blade opening. 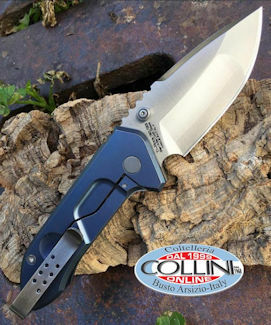 The 0450CF is a beautiful and compact folding knife for everyday use, with elegant features so that it can be defined as the gentleman's knife of Zero Tolerance's range, but at the same time it respects all the standards of reliability and performance we are used to seeing from Zero Tolerance.